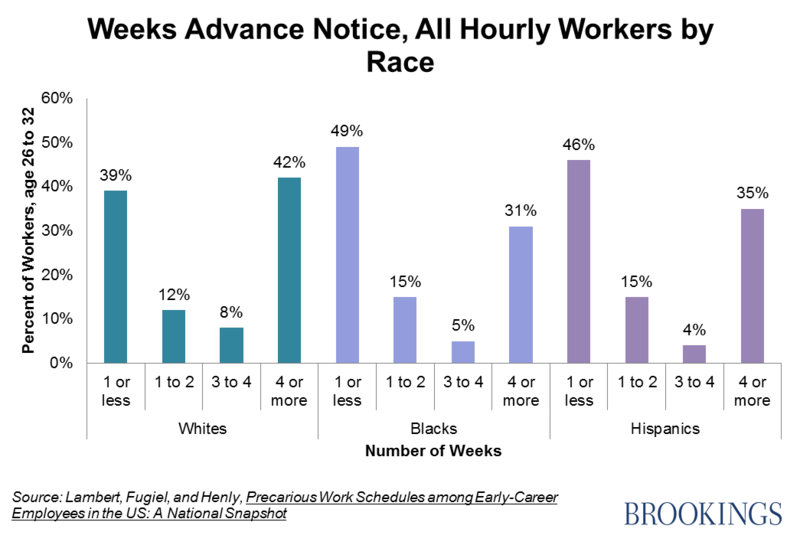 Do Unpredictable Hours Undermine Upward Mobility? It usually takes planning to move out of poverty. That’s doubly true for families with children; parents have to arrange childcare, doctor’s appointments and extracurriculars on top of work, job interviews, and adult education if they want to get ahead. But the rise of “just-in-time labor management” has made that increasingly difficult, especially for mothers and fathers who work hourly. Fifty-six percent of men and 61 percent of women in the workforce are paid by the hour, many in industries like retail and food service. A recent series of articles by the New York Times gave a snapshot of this new reality: computer algorithms crunch real-time sales data, which managers use to call in staff on a moment’s notice–or send them home if business slows. Susan Lambert, with her colleagues at the University of Chicago, used the National Longitudinal Survey of Youth (NLSY) to study the prevalence of last-minute scheduling among a representative sample of 26 to 32-year-olds. 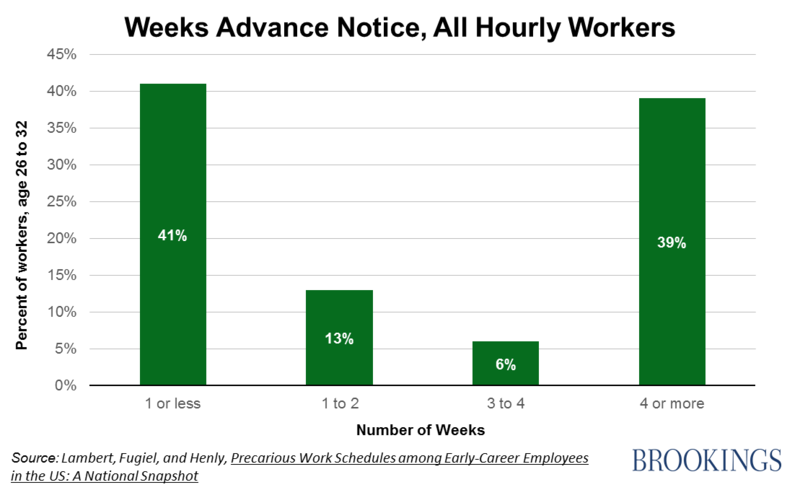 They find that 41% of hourly workers learn their schedules less than a week in advance—more than know at least a month in advance. Half of hourly workers have no control over their schedules. Among the 74% of workers who report weekly fluctuations in hours, average hours varied by 49% of their “usual” weekly hours. A 10-hour week can follow a 30-hour week. There are differences across demographic groups, and volatility is especially acute among part-time, retail, and food-service jobs. Hourly food-service workers in the NLSY sample saw 68% swings in weekly hours; 39% have no control over their schedules and 64% learn their schedule less than a week in advance. On average, women with part-time jobs experience 88% fluctuations in their hours; 38% of these women have no say in their scheduling and 41% receive less than a week notice. Nearly half of the hourly workers in the study have kids. “Just-in-time employment” may make business models more efficient, but it may also create uncertainty that undermines the best laid plans of low-income Americans. Surveys by Lambert and others have shown that unpredictable hours exacerbate stress, harm health, and propagate damaging work-life conflicts. Policymakers have some ideas about stabilizing hourly employees’ schedules, some of which have been put into practice. San Francisco just passed a bill requiring employers to set schedules at least two weeks in advance; Congressional Democrats have proposed similar legislation. Some business-owners oppose these efforts, and successful legislation will have to balance the interests of employees and firms. But one thing is clear: working to make tomorrow better is hard, when today is so uncertain.